# or "yarn add puppeteer"
Note: When you install Puppeteer, it downloads a recent version of Chromium (~170MB Mac, ~282MB Linux, ~280MB Win) that is guaranteed to work with the API. To skip the download, see Environment variables. a version of Puppeteer that doesn't download Chromium by default. # or "yarn add puppeteer-core"
browser you intend to connect to. of Browser, open pages, and then manipulate them with Puppeteer's API. Puppeteer sets an initial page size to 800px x 600px, which defines the screenshot size. The page size can be customized with Page.setViewport(). Example - create a PDF. See Page.pdf() for more information about creating pdfs. // Get the "viewport" of the page, as reported by the page. See Page.evaluate() for more information on evaluate and related methods like evaluateOnNewDocument and exposeFunction. See Puppeteer.launch() for more information. See this article for a description of the differences between Chromium and Chrome. This article describes some differences for Linux users. Puppeteer creates its own Chromium user profile which it cleans up on every run. specified amount of milliseconds. It's another way to help see what's going on. Capture console output - You can listen for the console event. The test will now stop executing in the above evaluate statement, and chromium will stop in debug mode. will be logged via the debug module under the puppeteer namespace. debug your test inside chromium like a boss! Check out contributing guide to get an overview of Puppeteer development. The Chrome DevTools team maintains the library, but we'd love your help and expertise on the project! Speed: Puppeteer has almost zero performance overhead over an automated page. Security: Puppeteer operates off-process with respect to Chromium, making it safe to automate potentially malicious pages. Stability: Puppeteer should not be flaky and should not leak memory. 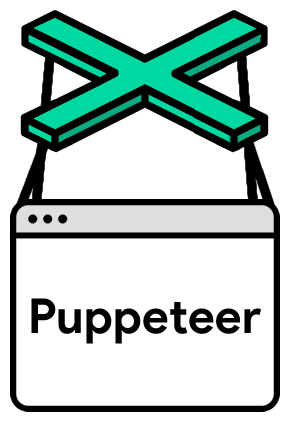 Simplicity: Puppeteer provides a high-level API that’s easy to use, understand, and debug. Selenium/WebDriver focuses on cross-browser automation; its value proposition is a single standard API that works across all major browsers. Puppeteer focuses on Chromium; its value proposition is richer functionality and higher reliability. From Puppeteer’s standpoint, “navigation” is anything that changes a page’s URL. Aside from regular navigation where the browser hits the network to fetch a new document from the web server, this includes anchor navigations and History API usage. sniffing for accompanying events. For example, every trusted 'click' event is preceded by 'mousedown' and 'mouseup' events.